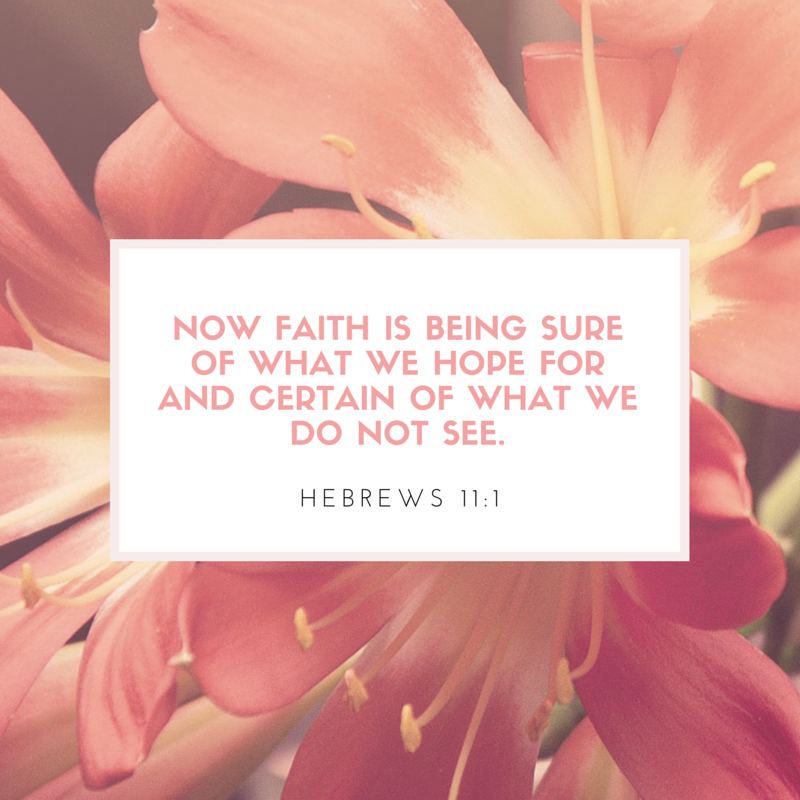 Hebrews Chapter 11 is know as the “Great Hall of Faith” chapter because it recounts those who had tremendous faith – Abel, Enoch, Noah, Abraham, Isaac, Jacob, Joseph, and Moses. I remember this chapter so well because it was read at my mom’s funeral. One of the things I remember most about my mom was her steadfast faith. Despite her 9 year battle with cancer, her love of God remained intact and grew stronger over the years. Like so many in the Bible, my mom showed me that in the midst of adversity, we can still have faith that God is in control, and I’m so thankful she modeled that for me. I have read this chapter several times, but this was the first time that verse 13 really stuck out to me. These “heroes of the faith” never received what God promised them. Instead, God gave them a glimpse of how He would fulfill that promise in the future. For example, God promised Abraham that his offspring would be more numerous than the stars. Abraham never got to see that, but he did get to experience his son Isaac being born and then being saved (God told Abraham to sacrifice his son and at the last moment provided a ram instead). Those instances must have encouraged Abraham’s faith. While I have faith that God knows what is best for me and is in control, what glimpses of promises to be fulfilled is He currently giving me? What glimpses has He given you? I pray that He opens my eyes to see those moments so that my faith grows stronger. I may not see the final outcome, but I can have assurance that God has and will continue to work through all the details. When I take my last breath, I want to have lived a life full of love (for God and others) and of faith. This is awesome Julie, thanks for sharing. Love your very neat sharing here, Julie! Just wanted to say a huge “AMEN!” to what you wrote about your mom modeling her trust in the Lord and his sovereignty over her life! She shared the facts of what she was dealing with–but never really complained or despaired about her lot in life! She was such a huge inspiration to so many of us. We also benefited by the trust and faith she modeled! Isn’t it amazing the far reaching effects of modeling? You were blessed to have such strong faith shown to you. Your mother would be proud to see her daughter today. As I must release control of my 17 year old daughter, little by little, I struggle with knowing there is a future for our relationship. Having faith that I will be able to be in her life as she sets off on her life in college I am on my knees constantly in prayer about this. I pray for peace that surpassing understanding. My mother died when I was 9, after several years of battling bone cancer. Thanks for sharing. That must’ve been so difficult to lose your mom at such a young age. I will join you in praying for your relationship with your daughter.